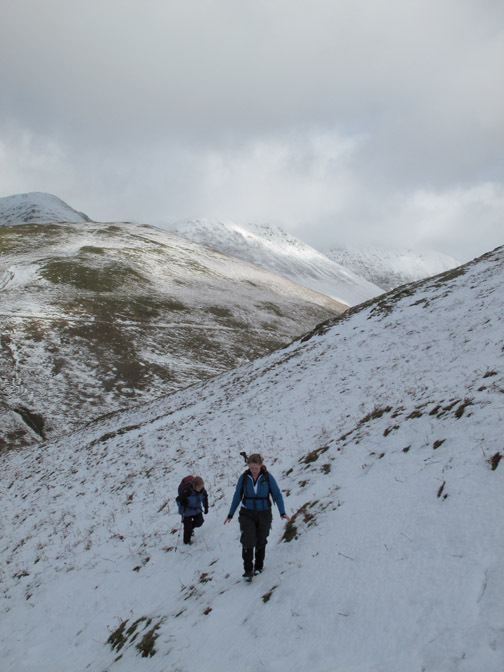 " Snockrigg and Warnscale "
Date & start time: Saturday 26th February 2013, midday start. 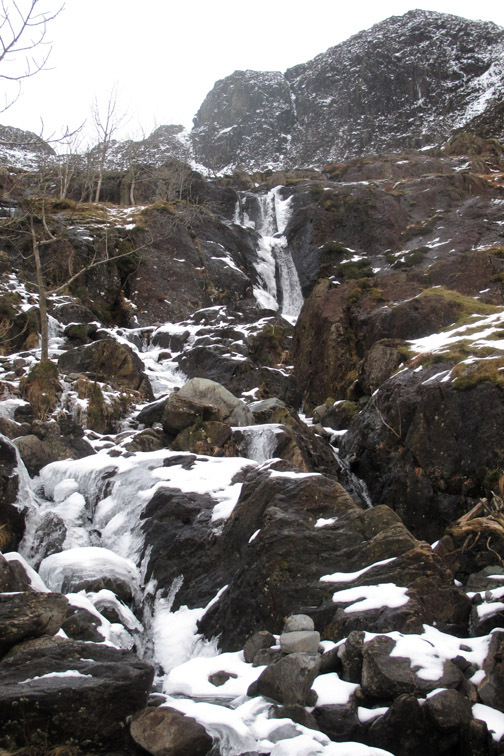 Walk details : Two shorter walks of 1.5 and 2.5 miles, 800 and 500 feet of ascent. Highest point : Being able to get out and enjoy the snow without any cars getting stuck. 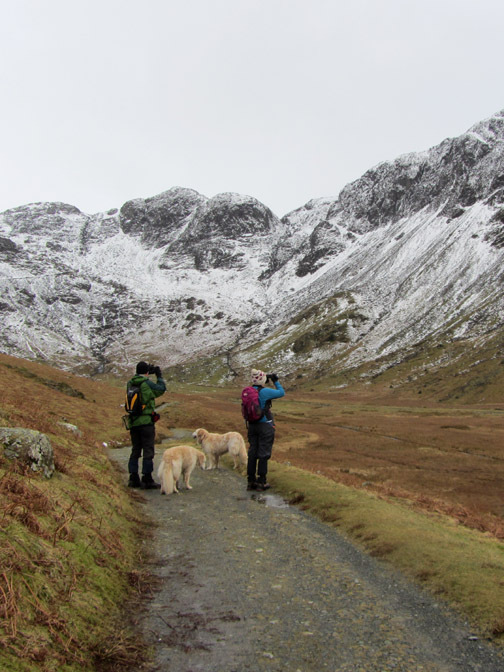 Walked with : Jenna, Ann and the dogs, Harry and Bethan. Weather : Overcast and dry. Sunshine to start but it faded well before sunset. What a difference a day made . . . . 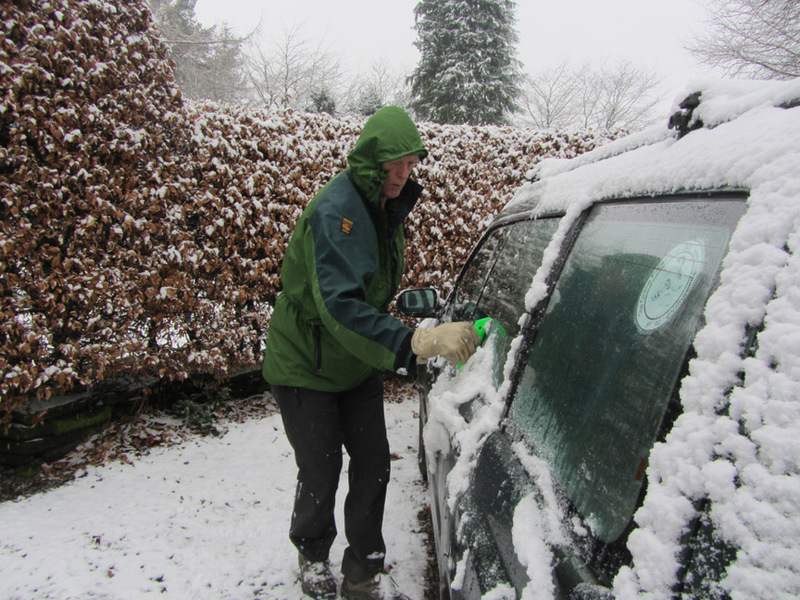 This was the scene yesterday (Friday) morning as we left Southern Scotland to return home. Our daughter was due that evening but was thwarted by heavy snow on the A1 and A66. She had an unplanned stay overnight in Doncaster instead and successfully drove over to us, leaving there at at first light. 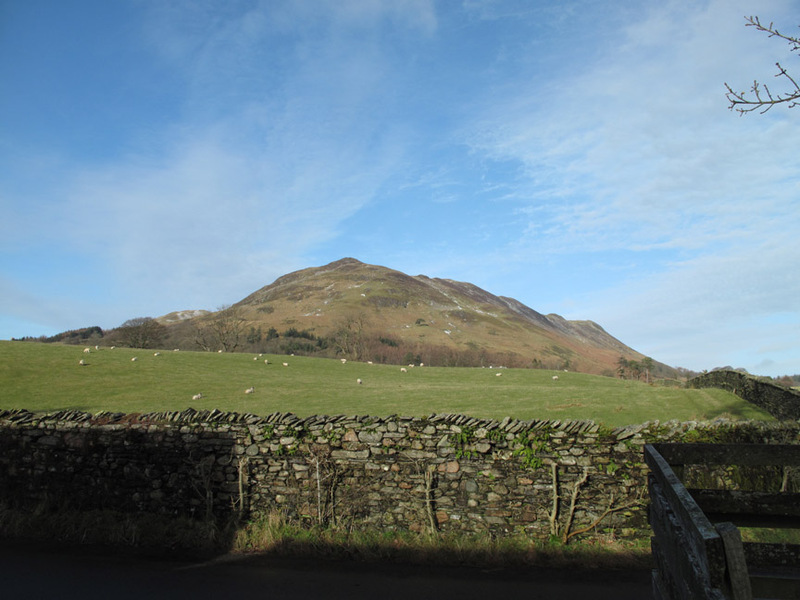 and by midday today this was our view of Low Fell from our front door in Loweswater. 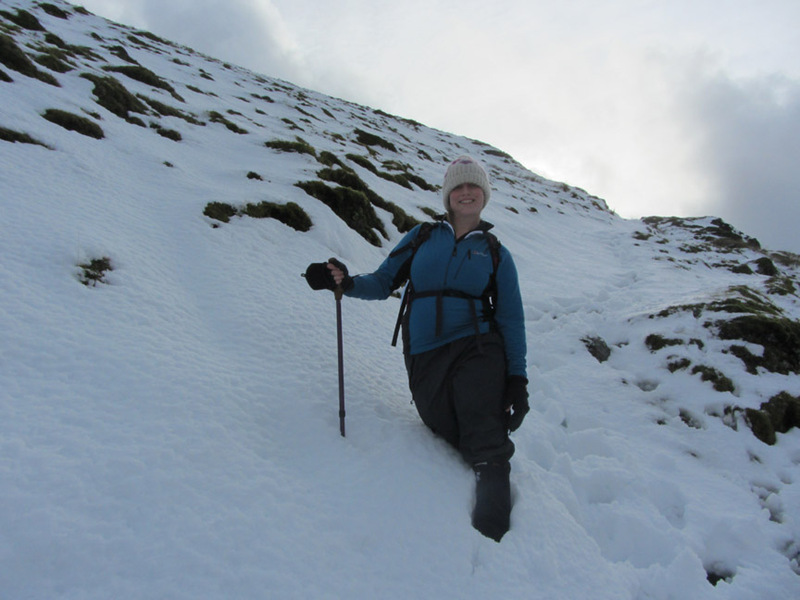 After all the effort Jen had made to get here it was definitely time to get out for a walk ! After the less enjoyable drive up she wanted to go for a walk and ENJOY the snow . 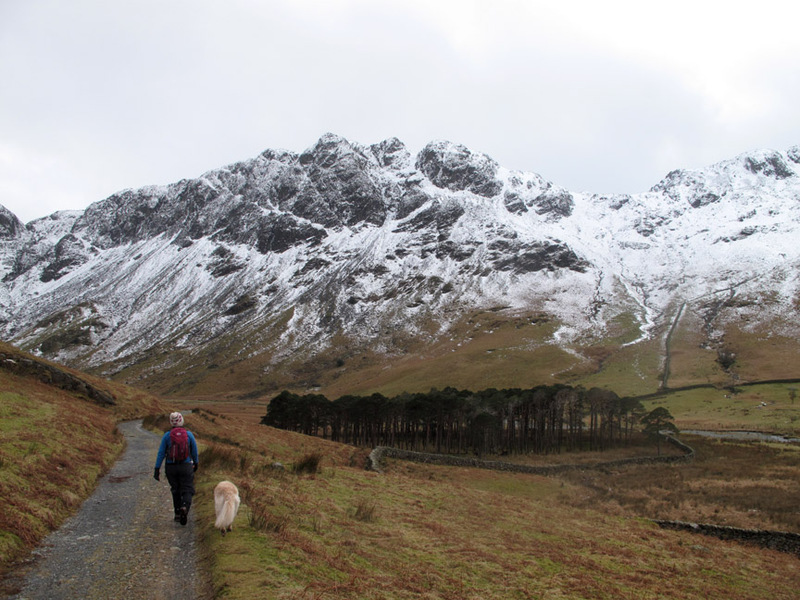 . . so let's go up towards Buttermere. 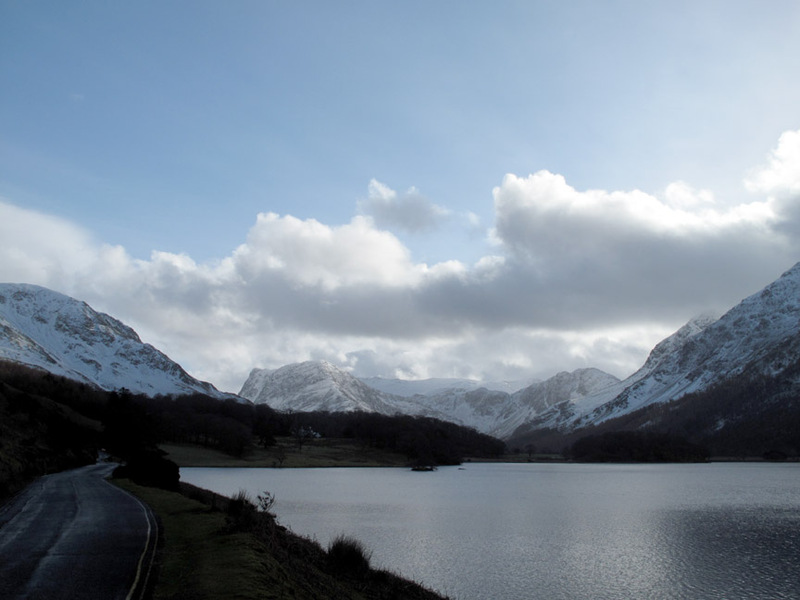 To get there we have to drive along the side of Crummock Water. 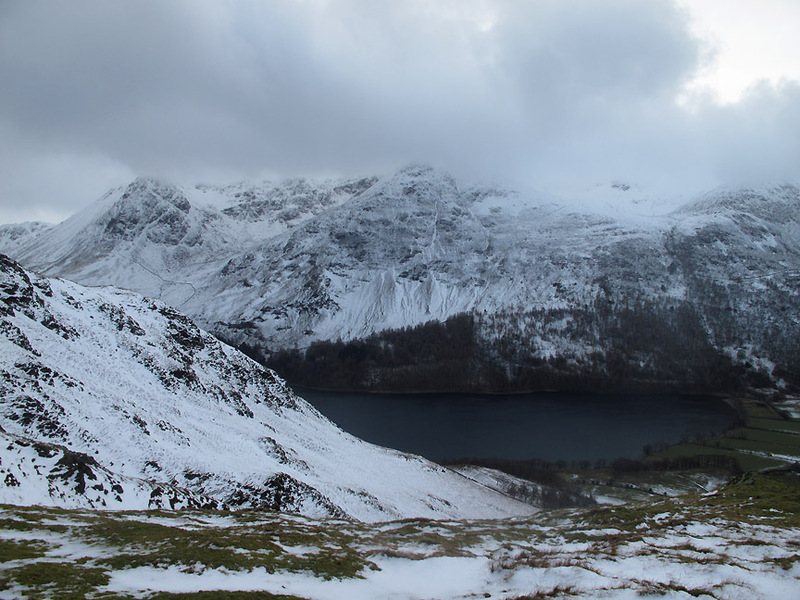 This was the view across to the High Stile Ridge . 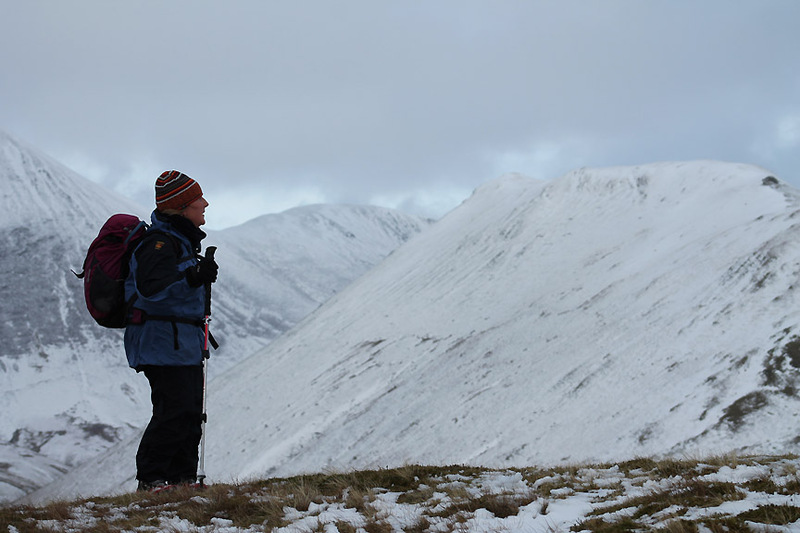 . . there's still plenty of snow on the higher fells. 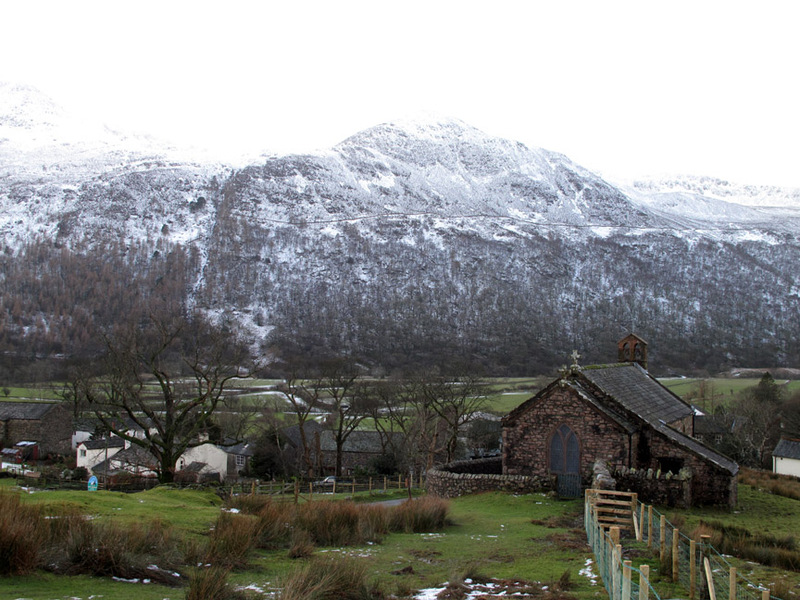 The view up Crummock Water to Wood House. 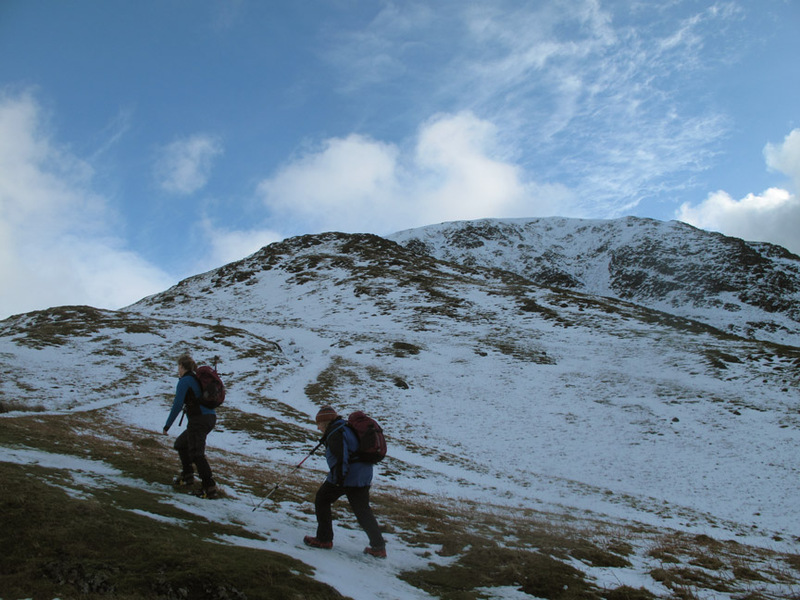 We were aiming to climb High Snockrigg on the left . 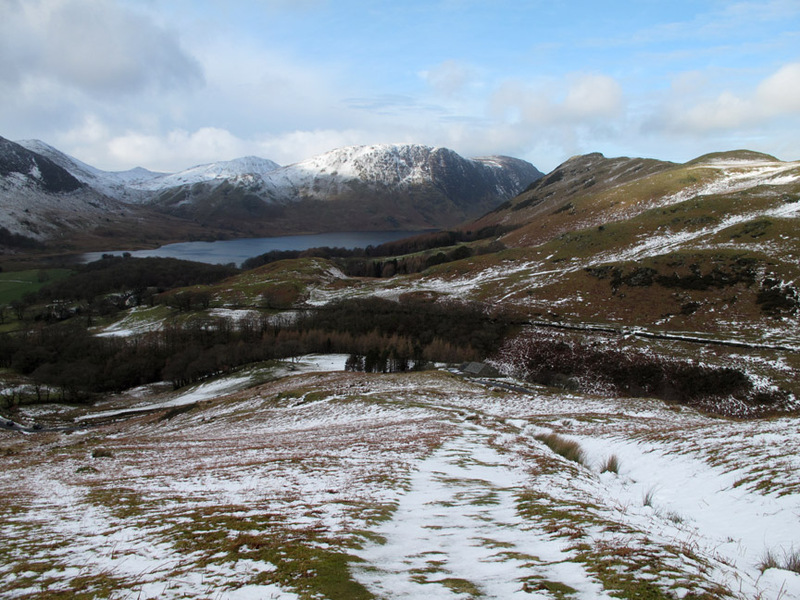 . . the fells at the end include Fleetwith Pike, Brandreth and Haystacks. 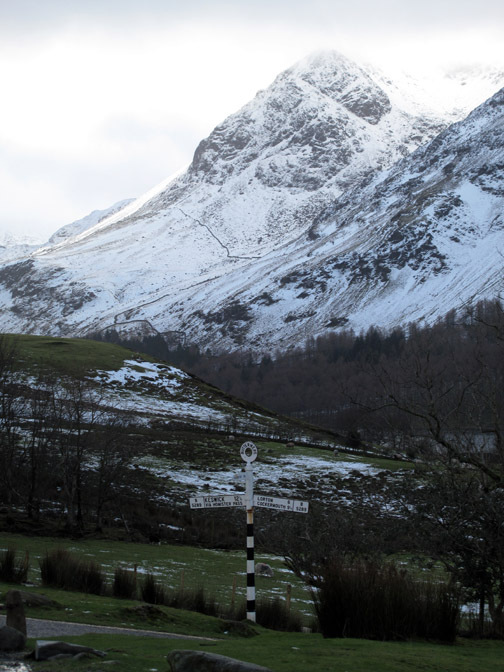 A positive signpost as opposed to Loweswater's negative one. A short way up the road we took the path onto the fells. This is most probably an old Lakeland peat road . 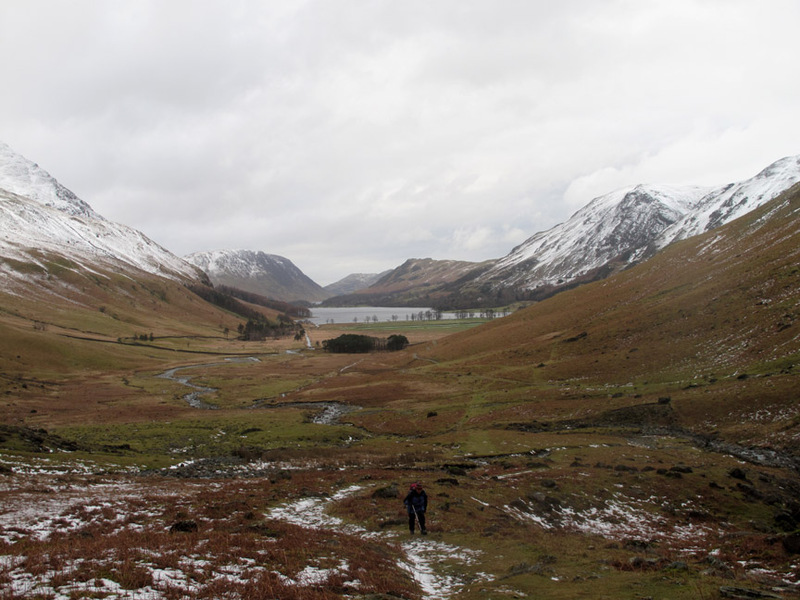 . .
a route used to bring peat (the dried turf used as fuel) down to the village from Buttermere Moss. Today we'll use the path to climb up as far as we can. 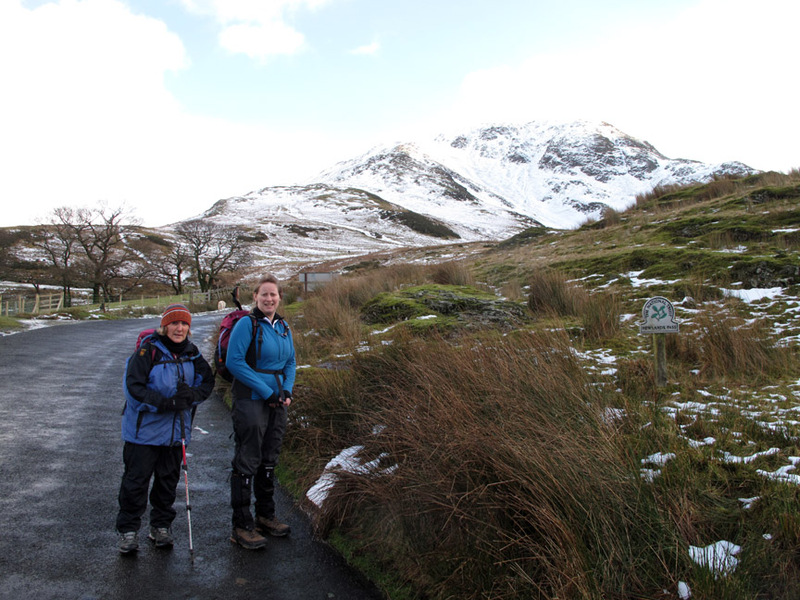 Jenna and Ann taking to the grass as the path is snowbound.
" Wrapped up against the cold "
As we climbed higher we lost the protection of the valley and at times it really was hat and glove weather. The breeze was cooler because it had travelled over the snowfields to the south west. 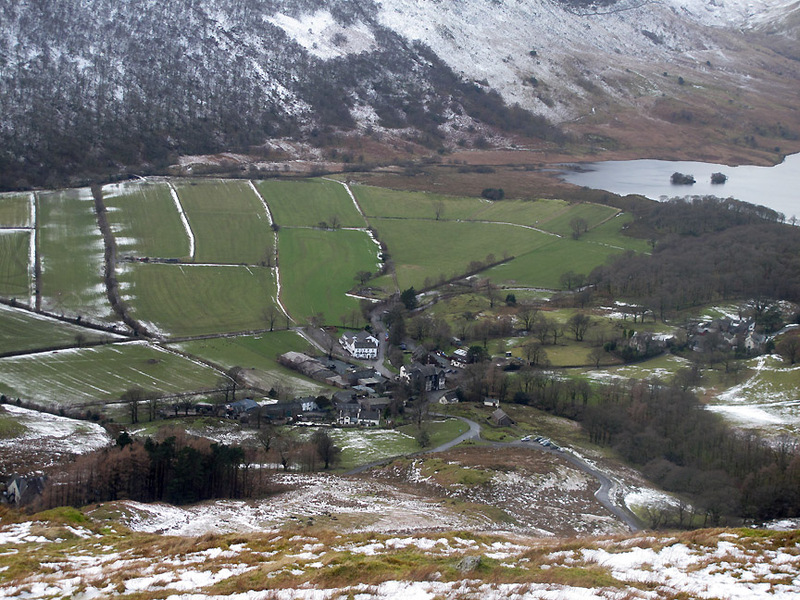 A slight diversion right to get a clear view down to Buttermere lake. 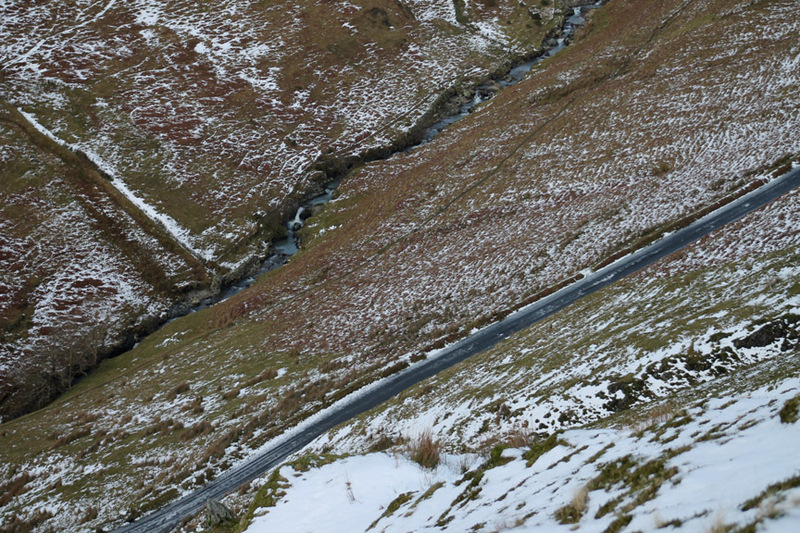 A slight diversion left this time to look down onto the Newlands Pass road. 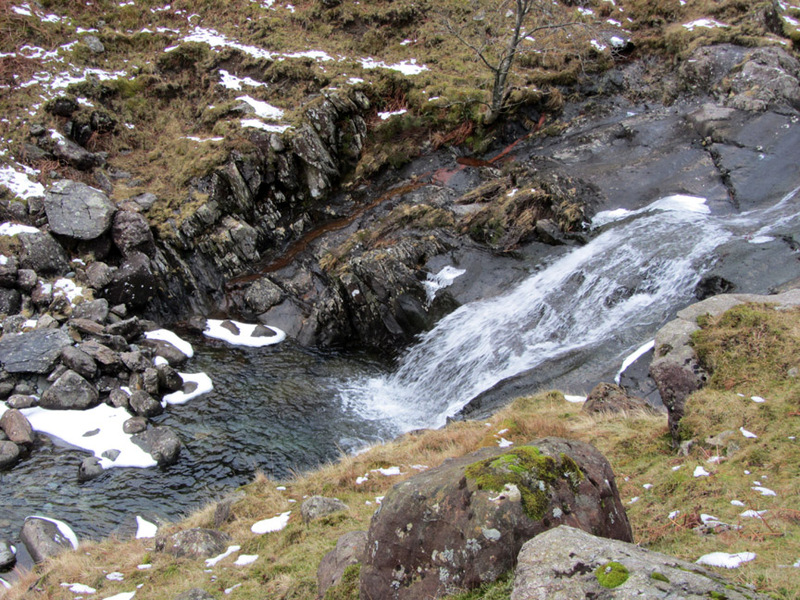 but what snow had melted was now rushing down Mill Beck at a fast rate of knotts. 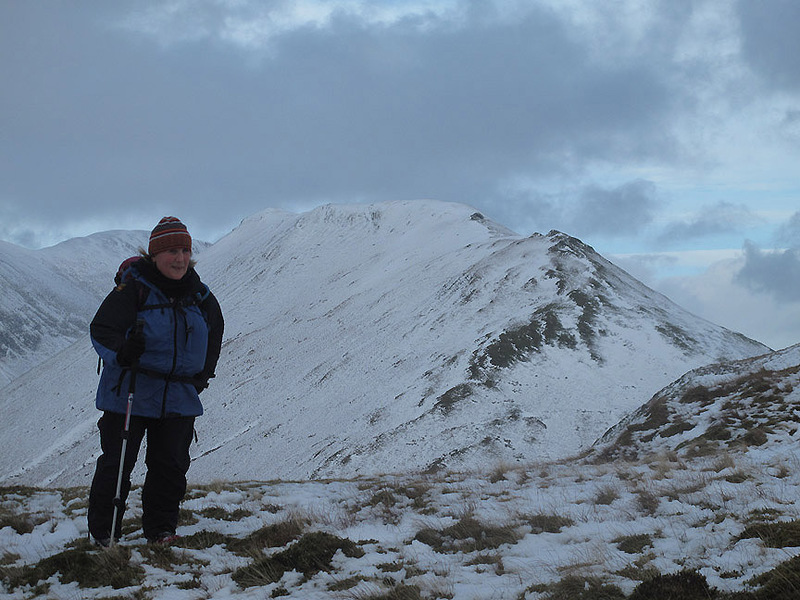 Ann contemplates the next, steeper section of the climb up onto High Snockrigg. The path does a few zig-zags as it climbs . . .
. . . but it is still pretty steep and slippery. 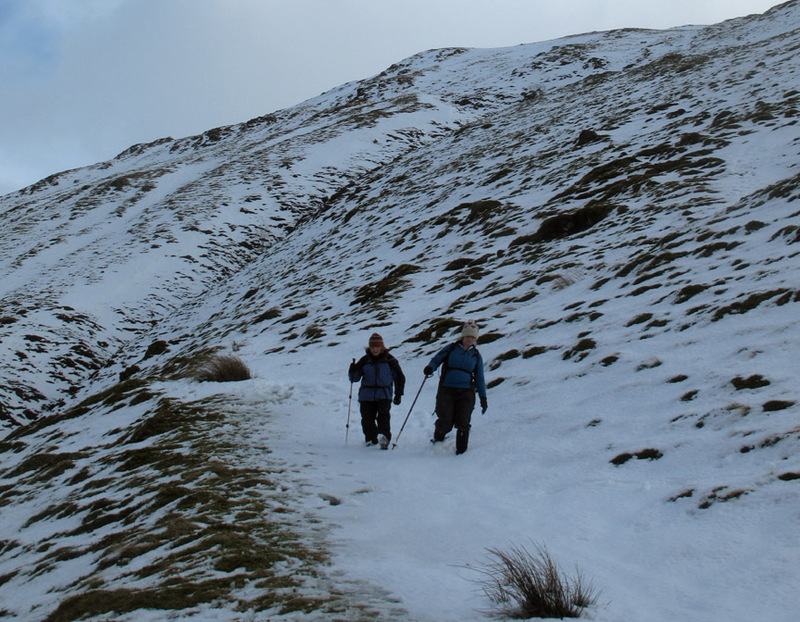 We reached another slight level section on the way up the fell. 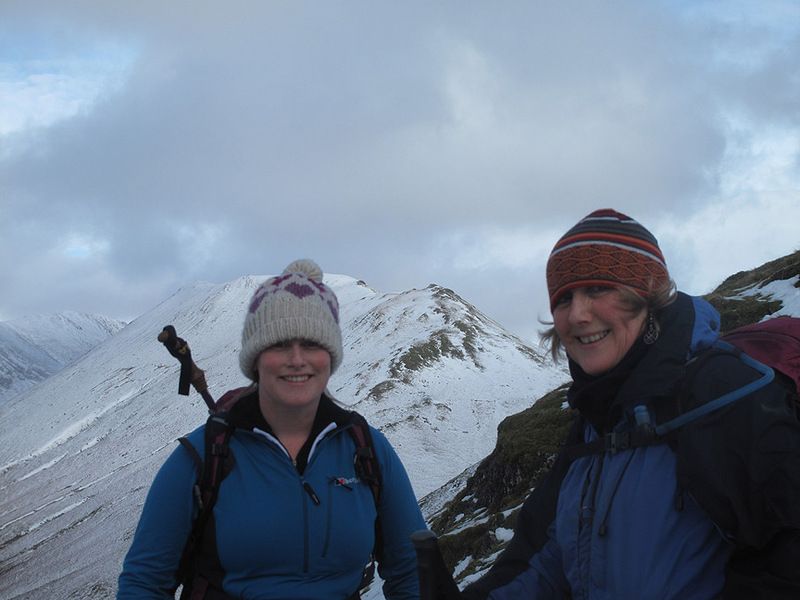 Behind us is the ridge of Knott Rig / Ard Crags. 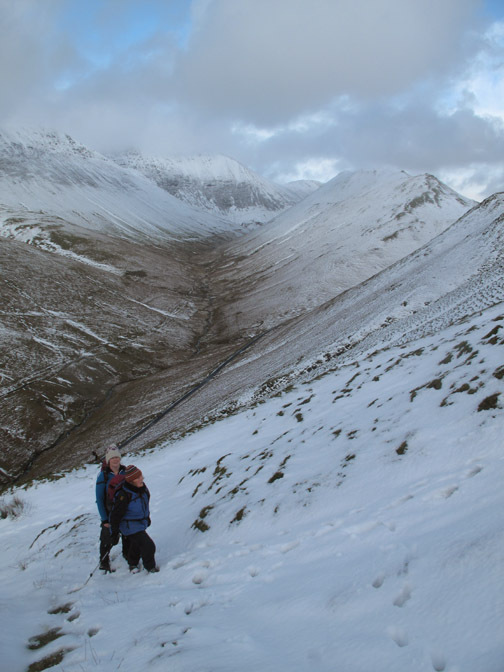 as it involved a tricky section above the gully on the Newlands side of the fell. Time to turn around and head back down. 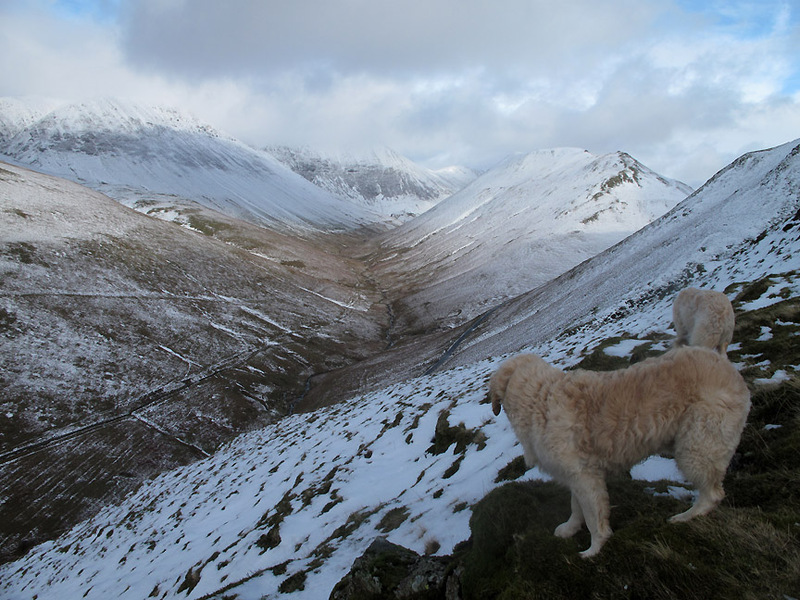 Back down the fell . 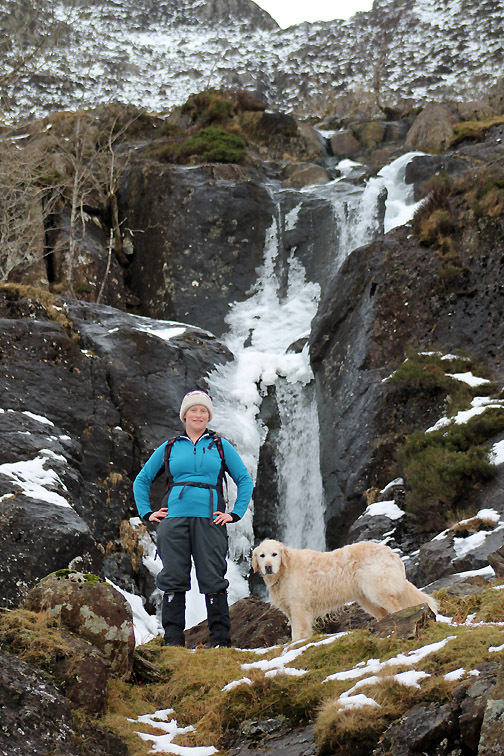 . . that gully can be seen behind us . . . the top part is always very slippery even in summer. 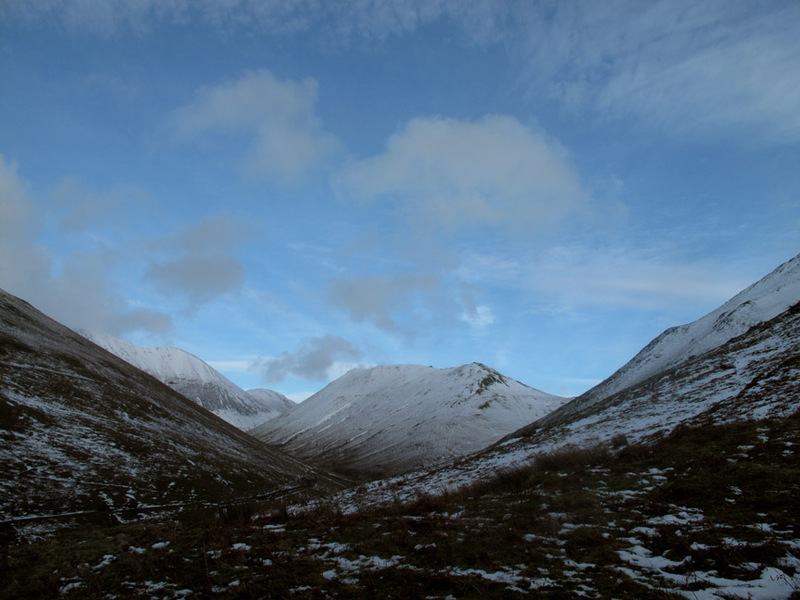 with the white slopes of Sail and Scar Crags set beautifully against the blue sky above. 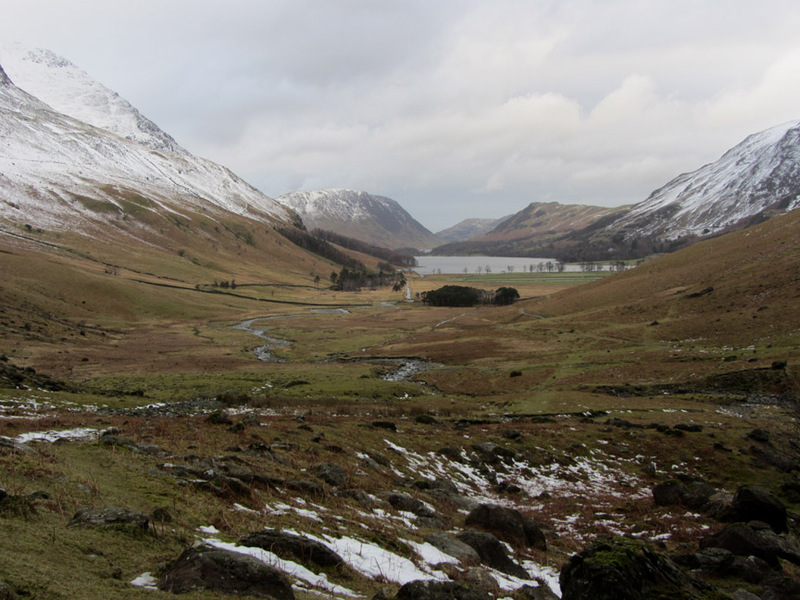 Back down now to Buttermere village. The car was parked next to the church. The double fence alongside the road will presumably soon have a small hedge planted within. 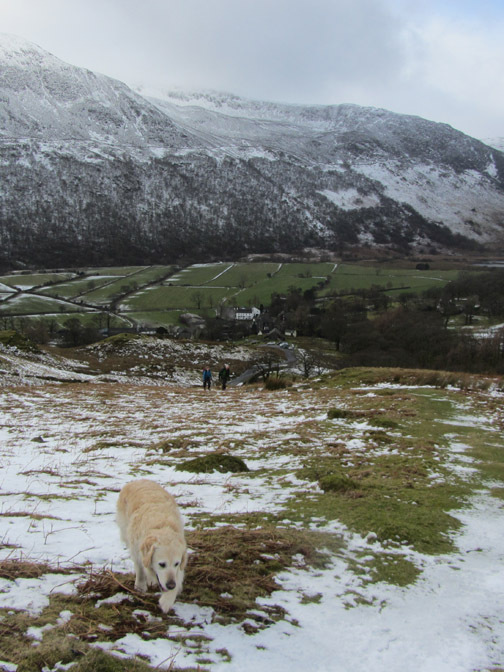 As we cut the first walk short, Jen asked to re-visit Gatesgarth for a walk up the valley. To get there we drove up the valley past the Buttermere Pines . . . the skies however are clouding over slightly. Warnscale Bottom . 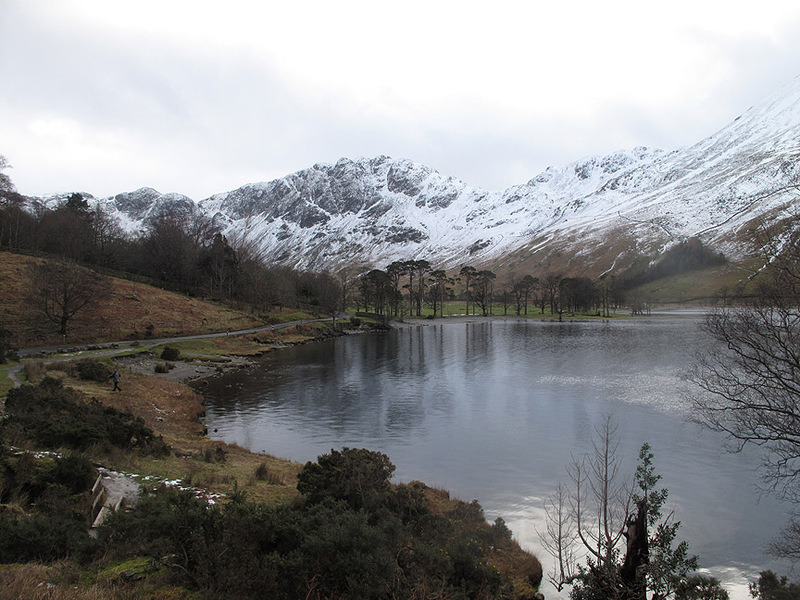 . . the short valley up from the top of the lake with a walled thicket of Scots Pines. 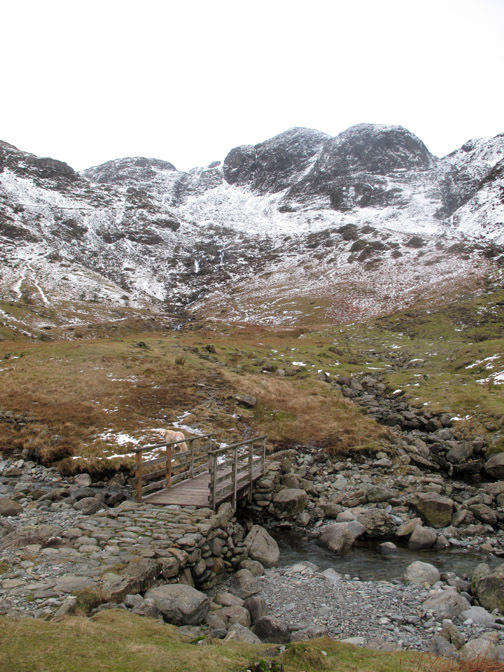 The valley drains the Warnscale Beck leading down from Dubbs Quarry and Black Beck leading down from Black Beck Tarn. 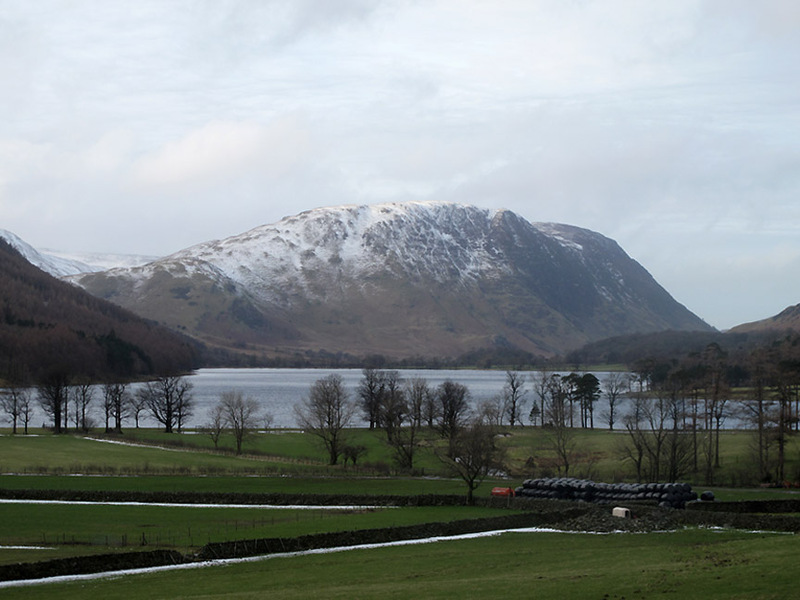 Looking across the fields and down the length of Buttermere. 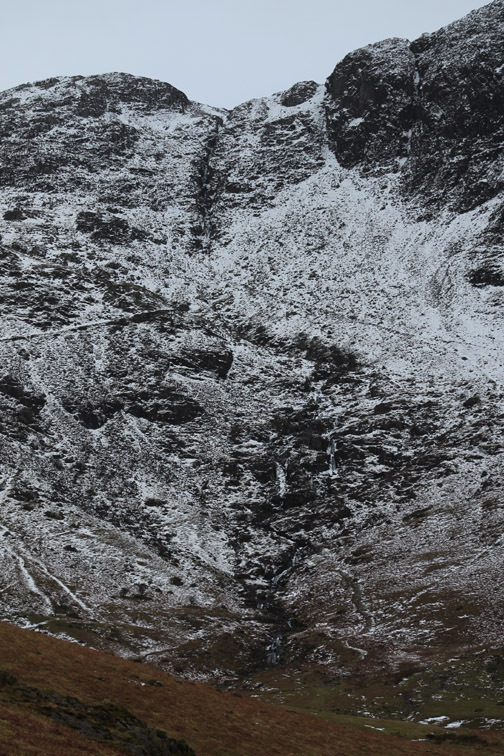 There's more snow on the southern end of Mellbreak than there was on the north due to the direction of the rain last night. Looking up at the Warnscale Beck Falls . . .
. . . and the Black Beck Falls. The ones on the left have a good path up either side . . . the ones on the right are out-of-bounds unless you know what you are doing ! Looking back down the length of Warnscale Bottom. 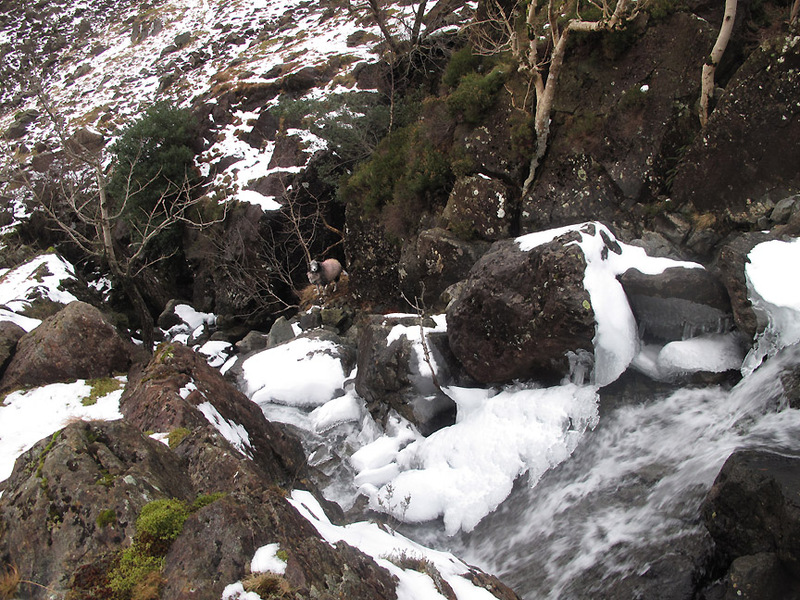 Plenty of water about today despite the colder conditions up near the snow. 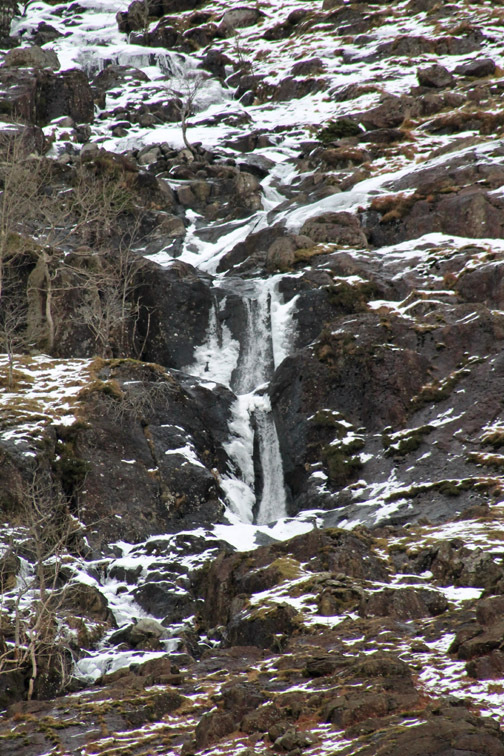 Zooming in on some of the waterfalls that cascade down the fell. Jen wants to try and reach the top right hand one. She really enjoyed the gill-scrambling she did up here last summer with her friends from Peterborough. 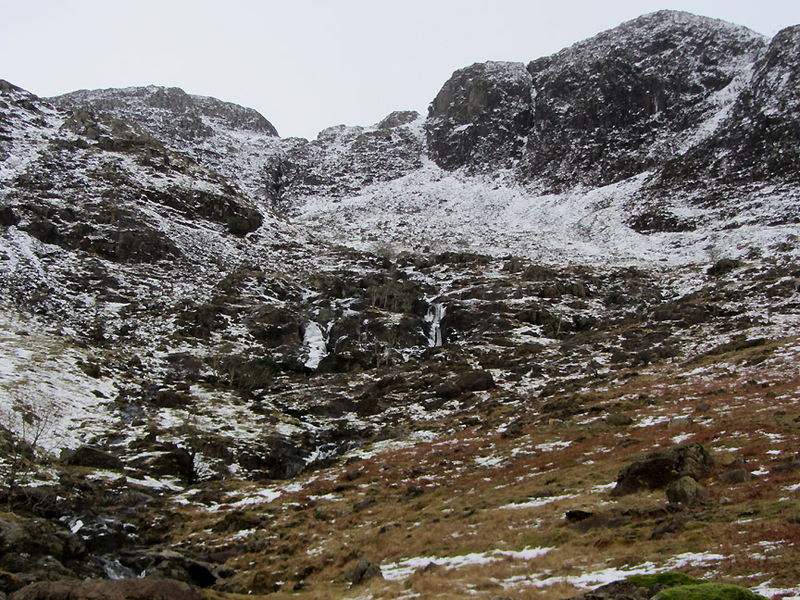 The waterfall ahead was one of the highlights on their wet walk that day . . . but today's object was to keep warm and DRY ! 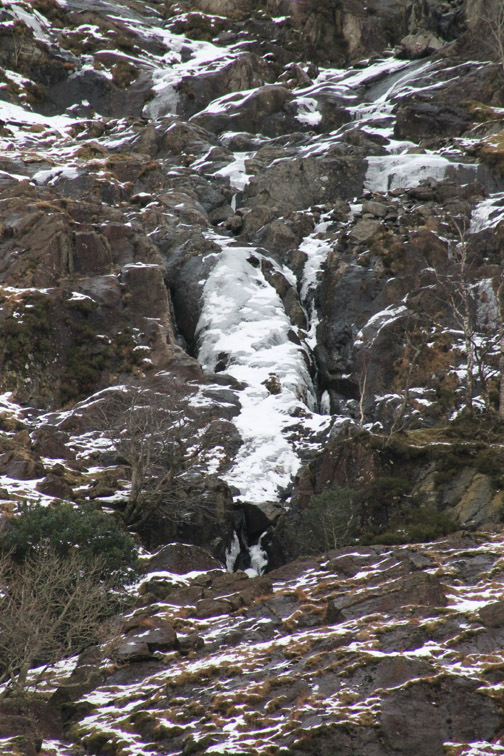 Zooming in on the ice-covered rock . . .
. . . and the still flowing waterfall.
" Spot the Sheep Competition "
How she got there I don't know but she should be able to get out of her own accord once she has satisfied herself about the quality of the grass.
. . . made it ! 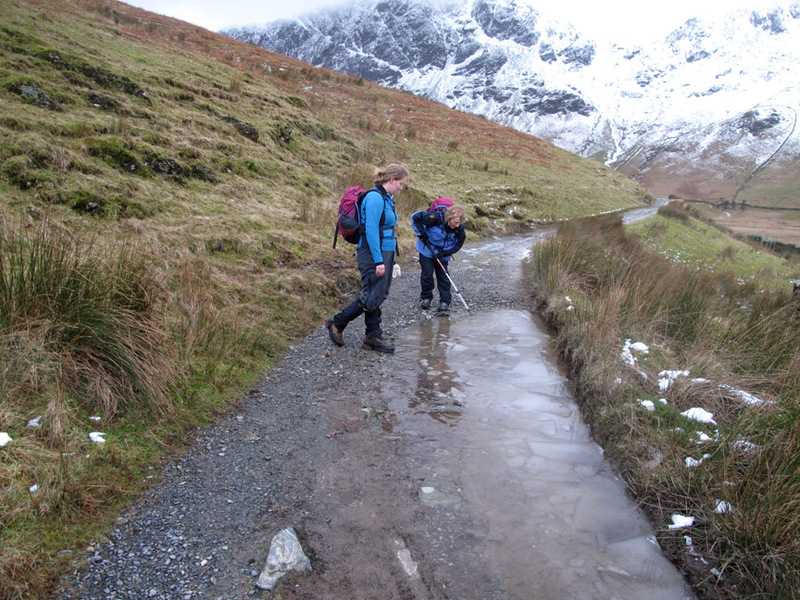 The Honister rocks are particularly slippery today . 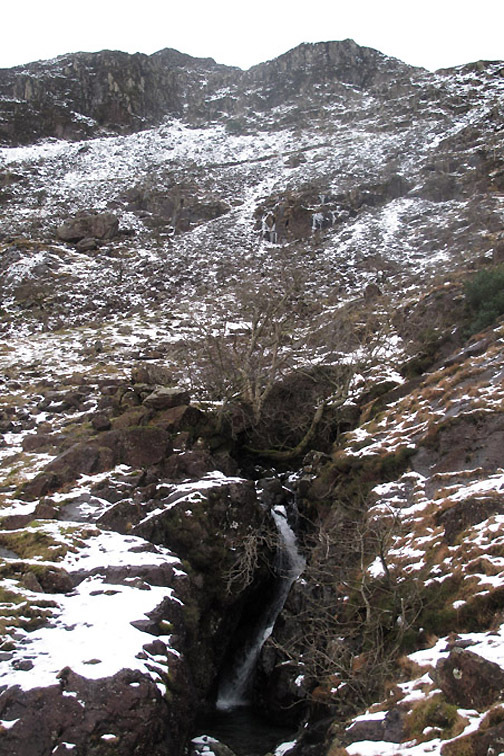 . . but there's sufficient grass to climb all the way to the falls. Ann stayed a little lower, overlooking a lower waterfall, choosing not to join us on the last hundred feet. Hold your cursor over the picture to " Spot the People " clue this time. 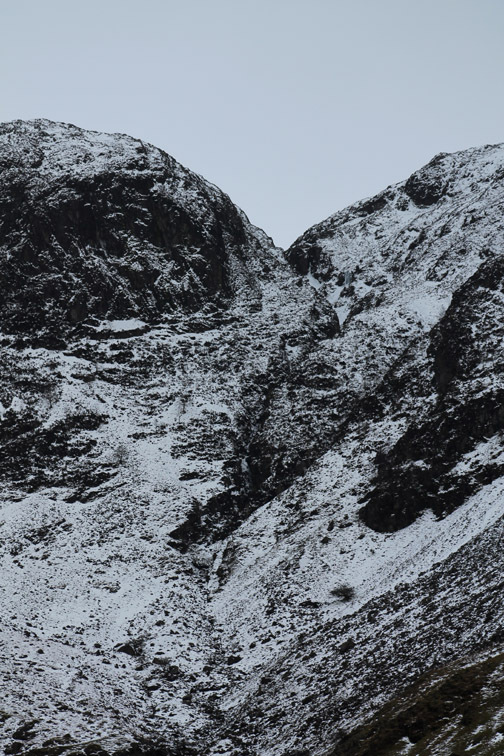 The above-the-snow panorama of Warnscale Bottom from the same location. We walked back down to where Ann had been sitting and headed for home. Ann with a pokey stick . . . the 102nd use of a trekking pole . . . to move the ice sheet across the puddle. Walk one from walk two . . . though to be more technically correct . . . where we might have walked to on walk one from walk two. but we had prefered to stay warm and dry and enjoy the snow . 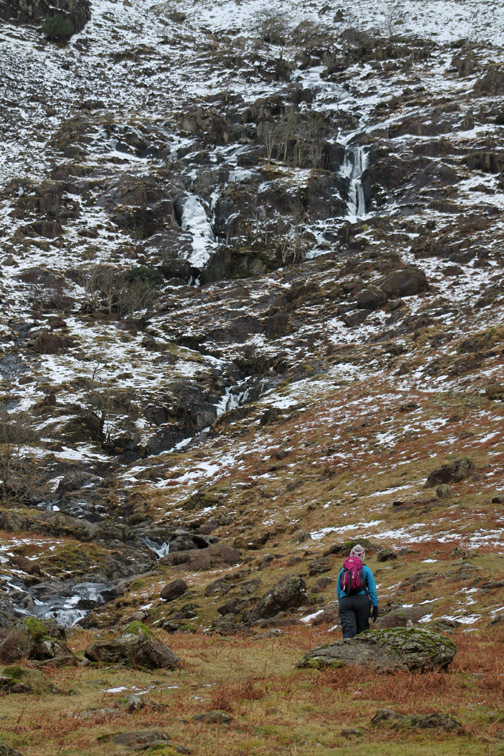 . . .and Jen had seen the waterfalls she visited on her climbing day out last summer. This site best viewed with . 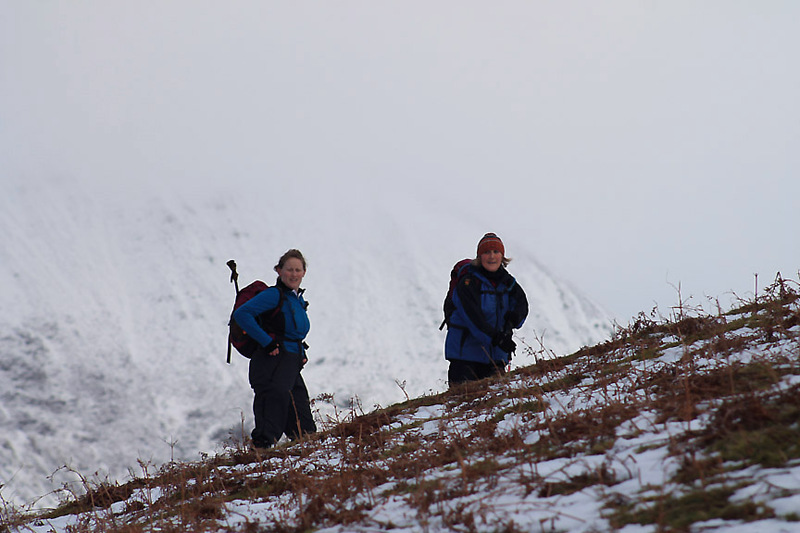 . . a variety of local options to suit the weather.